After lots of talking and thinking, hubbs and I have finally made the FIRM decision to pack up and sell. Not that we're moving anywhere far away or exotic...just to a different house within the NW part of Calgary. 2) I am returning to work next fall. Both Shane and I have busy jobs that have somewhat unpredictable hours. We have decided that the best child care avenue to pursue for our two young children is to get a live-in nanny. So, we need a house that can accomodate that. If we get the right nanny, it will definitely simplify my life as a working mom. 3) Choosing a home in a family friendly neighbourhood with a K-9 school, childrens sports and extra-curricular programs and lots of young families will simplify our commuting for school, programs, playdates etc. 4) Shane and I each need space to pursue business and personal work at home. Our shared office doesn't really work for us. and My little scrap corner of the family room just won't cut it if I continue to grow my scrapbooking business. So looking for a home with a dedicated office space for Shane and an additional bedroom or other type of closeable space for me would be ideal. 5) Our present house (while in good shape) would need some renovations to work for us. Choosing a house better suited to our needs means we don't have to live through the drywall dust and noise and dirt of another major renovation. So with all that in mind, we are going for it! Our realtor came over last night and we discussed what needed to get done around here and what we want in a new home. First the work of prepping our house for sale begins - a little painting, decluttering, cleaning, tidying and staging! Whew...I know it will be a lot of work, but I am excited about the change and I am raring to get going. I have to prepare for the crop this Saturday and then select the new design team and get them sorted out, but by the beginning of next week I hope to dig in and start getting the house prepped. 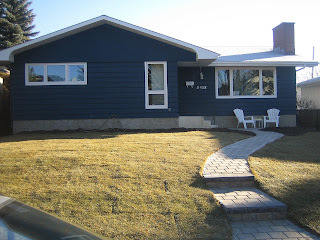 For now the only other question is...anyone wanna buy a cute little blue house?